Crispy Broast provides all sorts of variety in fast food. 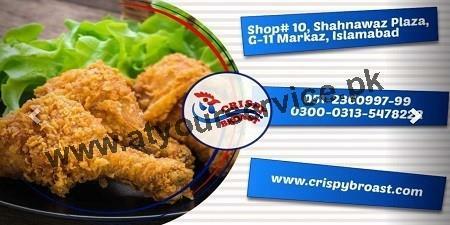 Crispy Broast is located in Shahnawaz Plaza is located at G11 Markaz, Islamabad. It provides all sorts of variety in fast food. Pizza is a yeasted flatbread typically topped with tomato sauce and cheese and baked in an oven. It is commonly topped with a selection of meats, vegetables and condiments. We serve the best Pizza in town. Broasting is a method of cooking chicken and other foods using a pressure fryer. Many modern fast food chains also deep fry chicken under pressure, and uses different recipes or equipment in consultation with one of several alternate suppliers.